As usual I am behind with editing, so the photos of the costumes at the V&A have yet to "materialise" [did you spot the rather heavily laboured pun there!!]. Hopefully I will get back to it next week. In the meantime I have gone and done the only sensible thing when you've got a backlog....go and take more photos! I like to try and record some of the transitory images on my home patch when I'm driving around and have a gap between clients! 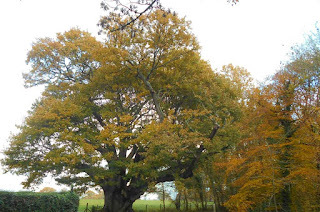 Yesterday I revisited The Sun Oak in Horsham [https://gnatbottomedtowers.blogspot.com/2018/05/beltane-2018.html]. He's now resplendent in all his Autumn foliage. I plan to capture him in the Spring and Summer too next year so I have the full set of seasonal shots. This one is such a lovely old gent. I have no idea why he's called The Sun Oak. I often wonder what history it has witnessed. I'm so backlogged on selecting photos from our August vacation to put into printed books as well. I don't want to have to pull out a computer though to relive the trip! Phew glad I'm not the only one then!